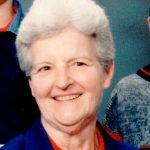 Geraldine Lucille Hutton, 93, passed from this life into the loving arms of Jesus Christ on Monday, November 26, 2018. Funeral Services: 10 a.m. Tuesday in Biggers Funeral Chapel. Geraldine was born to Homer and Freda Barbee in rural Ohio. She spent most of her life in Fort Worth as a homemaker who loved being a wife, mother, and grandmother. Geraldine will always be remembered for her warm smile and kind spirit. Geraldine was preceded in death by her husband, John E. Hutton, Sr. The family would like to extend their gratitude to New Hope Hospice and Ridgmar Medical Lodge for the care they gave to Geraldine. Survivors: Children, John Hutton (Carol), Aaron Hutton (Shirley), Cheryl Troub (Randy), Thomas Hutton (Sheila); brother, Bob Barbee; six grandchildren; four step-children; and 13 step-great-grandchildren. I have such fond memories of playing at Aunt Gerry's house in Fairborn, Ohio when I was young. She was such a sweet and loving person - seems she always had a smile on her face. So sorry to hear of Gerry's passing . She was a wonderful woman when I got to meet her. My thoughts and prayers are with you and your family. So sorry to hear that Gerry had passed. She is now with her loved ones in Heaven that have gone before. She was a kind, caring person that loved everyone. My thoughts and prayers to the family during this difficult time. I am so sorry to hear of Gerry's passing. I know she is with all her loved ones before her and most of all with Jesus. Love to you at this time of sorrow.